The Lazy Environmentalist: When will our Government wake up to the Energy Crisis? When will our Government wake up to the Energy Crisis? This is belated blogging. But I suppose that is the beauty of blogging - you can get back to it when you have time. The last month or so I have been pretty much out of the loop of things, but I'm now back on full(ish) form, with news to tell of what I've been getting to here in London that's worth noting. So, last week I attended the Praseg Annual Conference with my TREC hat on to get all and sundry up to speed on Concentrating Solar Power. The added bonus is of course the chance to sit in on various MP's waxing lyrical on their (sometimes not so) green credentials. 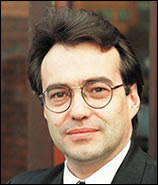 One MP did stand out however: Phil Woolas MP. This is a man who really seems to get it. In fact it is the first time I have heard a mainstream-ish Labour MP (outside the lone voices of climate change reason; Colin Challen and Michael Meacher) voluntarily raise his own views on Peak Oil. It is after all part of his remit as DEFRA Minister for the Environment; he has responsibility for climate change, energy and the environment. Nevertheless, it was interesting to hear his take. 12 months ago, he admitted, he would pay lip service to Climate Change. Now, he says, anyone who does not get it is in denial. "Well, it’s just happening, you can feel it - and see it all around the world." Yes, you do, I thought - you've grasped the urgency of the situation. "UK economic activity accounts for 15% emissions worldwide", he went on to say (note: this is a rarely alluded to fact by our government, so well done in not sidestepping this unattractive but vitally important fact), "2% of which comes directly from within our shores. Technology transfer and a global carbon market is required – and we must include rainforests. It is wrong to assume it’s all China – my experience is that China gets the point and is addressing it." On the Kyoto Protocol: "What concerns me is if there is not an international agreement at Copenhagen (Dec. 2009 is the date for the UNFCCC conference in Copenhagen and projected completion of UN post-Kyoto deal). I fear they will say - forget it, we will do what we have to do. But not many people are looking at the big picture. When canvassing last week, not many asked me to increase our Kyoto commitments." On Peak Oil: "Peak Oil is a symbol of all our other rapidly depleting resources. We are running out, we can’t keep on living as if we have three planets. This is a profound challenge to us." So, a man who talks the talk - but do we have a government who will walk the walk? The other morning when interviewed about escalating energy prices, our Prime Minister Gordon Brown on radio 4's Today programme claimed the solution was that we just need to get out there and "find more oil". Does he not know that we are, if not yet at Peak Oil pretty much on our way? The problem is, if the current escalation of energy prices to $126 a barrel are not attributable to peak oil, what will it be like when we are on the rapid downhill slalome race of declining output? This time last year oil was $75 per barrel and the lone voices predicting a hit of $100 per barrel by 2010 were viewed as extremists. Recent history demonstrates that even those with a bit of foresight were being too conservative in their estimates. As David Strahan said the other week at our WISE Women Speaker Event - we ain't seen nothing yet. But there is a further layer of complication to add to the decline in global energy resources. We have our own homegrown decline in energy resources to contend with here in the UK. We have a swathe of opted-out old coal stations that must, as directed under EU legislation, be closed by the end of 2016. Some are already working on limited capacity. Add to this the end-of-life of most of our nuclear stations (some of which are now working at very limited capacity, and when working at full capacity only accounts for at best 3.8% of our energy requirements. A dip in the ocean, you might say, in terms of what is required post 2016), and a picture emerges of a rather rapidly growing energy gap here in the UK which we have not been preparing for. By my simple calculations, if we say energy descent kicks in by 2010 at a conservative 3% per annum (peak oil puts additional strain on other finite resources), that makes an energy deficit of 18% by the end of 2016, before taking into account the UK energy gap dip of roughly 32% of our own capacity. That makes a remarkable 50% energy deficit within 8 years. So my calculations may be very simplistic (and possibly wrong - I am no expert forecaster). The slide above interestingly demonstrates the UK energy gap as approximately 32% reduction of capacity, with oil being completely factored out by end of 2016. Either way - there is a substantial UK energy gap that does not seem be addressed. Bill McKibben famously said in his book The End of Nature; until we feel the fear in our bellys, we will fail to act. How may more MP's need to feel that fear before they act?